Before we finally see "The Walking Dead" season premiere this Sunday, October 13, at 9 p.m., we might be asking ourselves, "Where did we leave off? What's going to happen next?... How can we get more Norman Reedus?" Well, you can thank AMC, because they've answered some of those questions with a series of new videos. 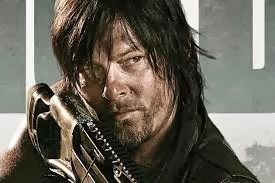 The clips recap the adventures of the Grimes Gang, along with a sneak peek of the new season and an interview with Daryl Dixon himself, Norman Reedus. Also, according to a press release from the network, the new season finds the Grimes gang "fostering a thriving community in the safe haven of the prison." "Sadly, in this brutal world, happiness is short-lived and walkers and outside threats are no match for danger brewing inside the fences," the release continues. "The group’s home and new way of life will be thoroughly tested, and their struggle to survive has never been so perilous. Season 4 also introduces several new characters including Bob Stookey (Lawrence Gilliard Jr., The Wire)." Check out the vids after the jump and hold onto your seats for "The Walking Dead" premiere this Sunday.